It’s no secret that retirement today will last longer than that of past generations, and it’s essential that a client’s retirement income lasts just as long. But how do advisors engage in conversations that reveal client expectations, make the clients aware of their own goals and priorities, and help them make the necessary adjustments to ensure a great retirement? Most skilled advisors already use an initial consultation/annual review questionnaire. Recently, I’ve discovered the immense value in tailoring these questions for each client. I developed a strategic core framework to simplify my questions and discover what clients truly want. Let’s examine each of the Five Core Client Concerns and the subsequent questions that arise. 1. Longevity Concern: Will I have enough savings to meet my basic living expenses? This goal focuses on the lifetime survival of clients’ savings to meet essential living requirements, e.g., housing expenses. According to a 2016 survey, the No. 1 concern of retirees is how not to run out of savings. Clearly, there are many things that can erode a nest egg, including market fluctuation, sequence risks, inflation, excessive withdrawals, and unexpected expenses. The bottom line remains: running out of money and not being a burden on family is still at the forefront of every retiree’s mind. Try asking your clients the following question: On a scale of 1 to 10, how much does the thought of running out of savings in retirement trouble you? 2. Lifestyle Concern: Will I have enough money to enjoy retirement on my terms? It’s one thing to have enough savings to meet your basic needs, but it’s another to maintain your desired overall standard of living and not be forced to make moderate to drastic lifestyle changes. These lifestyle components tend to be more discretionary in nature and may include things like travel and leisure, self-improvement activities, social engagements, and helping a family member. My friend, Dr. Wade Pfau, suggests that maximizing spending power is the key to meeting this concern. That way, spending can remain consistent and sustainable, while allowing for an acceptable degree of risk. Furthermore, clients must keep in mind that these expenses may need to be scaled back at certain points in retirement. Regardless of the components, lifestyle goals can be revealing when it comes to your clients’ retirement expectations. Try asking your clients the following question: On a scale of 1 to 10, how disappointed would you be if you had to adjust your standard of living to make your savings last? 3. Legacy Concern: How will I be financially remembered? How will you be financially remembered? This is my definition of Legacy. Traditionally, legacy goals relate to leaving assets for subsequent generations, or to charities. However, I believe it includes significantly more. It could be that your clients don’t have to borrow money from their children, move into their son’s spare bedroom, or ask their daughter to quit working to care for them. Try asking your clients the following question: On a scale of 1 to 10, how important is it for you to cut back on your retirement lifestyle if it meant leaving more legacy for your heirs? 4. Liquidity Concern: Will I have access to tax-advantaged money when I need it? Maintaining additional assets for unexpected contingencies is critical in retirement. The “what ifs” of retirement are endless and having access to a reserve for the inevitable is essential. They include the run-of-the-mill spending shocks for emergencies, illnesses, expenses, or just some enjoyment that will require extra money. Ideally, these reserves should be accessible with as little taxable or opportunity-loss impact as possible and without taking away from income that could be needed in the future. These types of Liquidity concerns most often affect those on a fixed income that covers their essentials. An example could be a teacher or retired auto worker who gets a pension, or a person who is collecting an annuity they purchased. They have income, but they may not have true liquidity. Try asking your clients: On a scale of 1 to 10, how prepared are you to handle a financial emergency or unexpected expense? 5. Long Term Care Concern: Am I financially prepared for the costs of health related expenses? 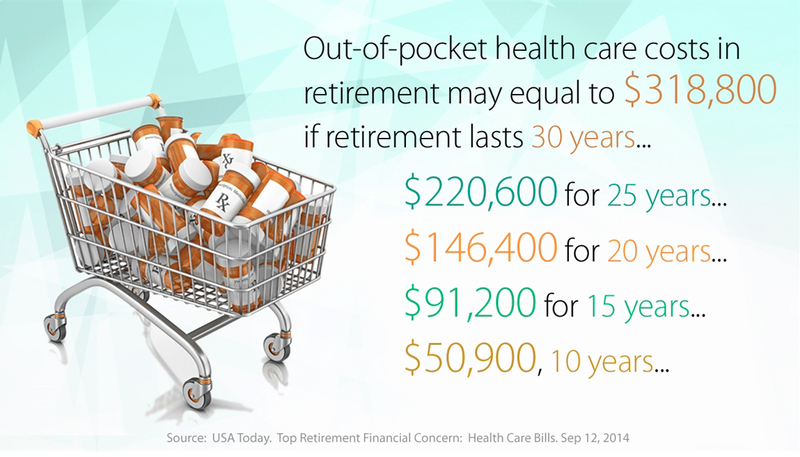 A couple retiring this year (2017) will need an estimated $275,000 to cover out of pocket health care costs in retirement, according to a recent Fidelity study. That’s a 6% increase over last year’s estimates and significantly more than 2014. This estimate applies to those with traditional Medicare insurance coverage and considers premiums, co-payments, deductibles, and out-of-pocket drug costs. It does not consider the cost of a nursing home or long-term care clients may need; that alone is estimated to be an additional $130,000. I have found this expense to be the one that most folks ignore almost completely. Try asking your clients the following question: On a scale of 1 to 10, how prepared would you be if you had to access an additional $300,000 for health care related costs? How much does this concern you? You’re meeting with a 65-year-old couple. They have $500,000 in savings, a $400,000 home, and a $155,000 mortgage with payments of $1,250 a month. Although you could ask the aforementioned questions verbatim, you could also employ a little creativity to get their Longevity, Lifestyle, Liquidity, Legacy, and Long Term Care concerns out in the open. Sample Question: What would retirement be like if you didn’t have to make a monthly mortgage payment? Their answer will be the conversational launching point for cycling through the Five Core Client Concerns. But remember, the fruit is in the follow-up questions. If a client says, “It would be great not to have to make that monthly payment,” you could then ask, “Why or in what regard would it be great?” And from there they will tell you about having more money to spend (Lf), or not having to draw out as much from savings (Lo), or being able to save that money for a rainy day (Lq/Lt), or using those dollars to help their grandchildren save for college or private middle school (Lg). You have helped your clients gain awareness of their goals and hone in on their expectations. You can now work with them to make the appropriate adjustments to help them achieve the retirement they want. How much does the thought of running out of savings in retirement trouble you? How disappointed would you be if you had to adjust your standard of living in order to make your savings last? How willing would you be to give up or cut back on your retirement lifestyle, if it meant leaving more legacy for your heirs? How prepared are you for unexpected spending shocks in retirement? How prepared would you be if you had to access an additional $300,000 for health care related costs?